Volunteers are oft en the heart and soul of small nonprofits – they put in their blood, sweat, and tears, they don’t get paid, and they are happy to be contributing their time towards something they believe in! When those small nonprofits are using Salesforce, very often so are their volunteers. When your user base includes lots of volunteers, there are a number of things to consider – and a number of things you might do a little differently than if your user base is paid staff. What’s the difference? A few years ago, I implemented Salesforce pro bono for a small nonprofit with a single paid staff person and a fleet of volunt eers. This was an organization whose work was based around community organizing, and as such, the staff person and volunteers all conducted many 1:1 relational meetings. Salesforce Activities would be perfect for documenting these, I thought! When I presented them to the Executive Director, however, she rejected the idea. “It’s cool, but we won’t keep up with it. Maybe sometime down the line.” Lesson learned, and I’m so glad this ED was far more realistic than I in that moment! One mistake to avoid here is not to implement something that the organization’s users do not have real time to learn or the ability to maintain, despite the temptation of Salesforce providing countless out-of-the-box solutions for a range of business needs. For many small nonprofits with volunteer users, the initial Salesforce buildout itself can be simple and straightforward, while more time may be spent on training and documentation than in other implementations. Security and permissions – more important than ever! Many people believe that smaller organizations are less in need of Salesforce’s built in security and permission features. And sometimes, that is true! However, when your users are all volunteers, it is essential to make the system as foolproof as possible. Because of time constraints and scheduling difficulty, volunteers generally receive minimal live training, and may be rotating in and out fairly frequently. Do them a favor and make it impossible for them to mess anything up! Their Salesforce tasks should be outlined clearly and they should be assigned profiles that only allow them to see/modify the data they need to see/modify and do the tasks they need to do. Implement validation rules as needed. For example, volunteers doing data entry of Contacts from an event do not need to be able to edit Opportunities (in some cases they don’t even need to see Opportunities). If your Contact object has hundreds of custom fields, perhaps create a profile for those volunteers that only has the key fields they need to work with. Doing this work ahead of time can save your volunteers and paid staff time and headaches, not to mention saving the organization money that they might have paid you or another consultant to help clean up bad data or recover missing data. 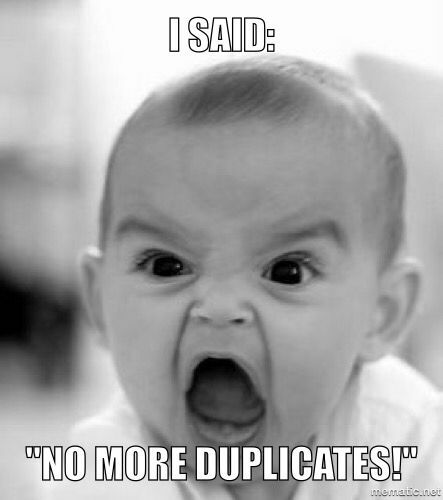 From day 1, set up Salesforce’s Duplicate Management feature (released Spring ’15). It is fairly simple and straightforward to set up, and your volunteers will thank you for helping them not reinvent the wheel or enter bad/repeat data in the system. Work with your main contact person to create guides, whether written out or in short videos, to document key business processes the volunteers will need to work through in Salesforce. Tools like Crowdguide and Screensteps can be particularly useful here, as they provide embedded guides of different styles to walk your users through a process. If there’s no budget for a documentation tool, use Salesforce Solutions or just a Word doc – whatever can be shared and updated easily! Your staff member does not need to be a fancy dancy 5x certified Salesforce professional, but they should know enough of the basics and be familiar enough with the Setup Menu that they can understand how objects relate to one another, where custom fields can be edited and created, how to modify page layouts, and how to create and modify reports. If they are particularly savvy, you can introduce validation and workflow as well. Given the size of the organization and the fact that they have so many volunteers, I’m going to go out on a limb here and guess that their budget for ongoing Salesforce support is pretty minimal. Make it as easy as possible for them to make changes on their own before they have to reach out to you. Now that you’ve set up your security and permissions, documentation, trainings, and duplicate prevention, set up some reports to help the organization monitor the quality of the data. Have the report/s emailed on a weekly or monthly basis to your main contact person, paid staff person, or the person you trained to do basic administration. If after reviewing these reports, that person is seeing major data quality issues, revisit validation rules, training, documentation, and permissions and adjust as needed. Volunteers rule! Give them the easiest, most foolproof system and keep them and the organization’s time and money focused on their mission, not on cleaning up data. Have more tips for implementing Salesforce for volunteer users? Please leave them in the comments!